Vacation rental cottage. Sleeps 6, 3 bedrooms, 2 bathrooms. Cats, Dogs allowed. 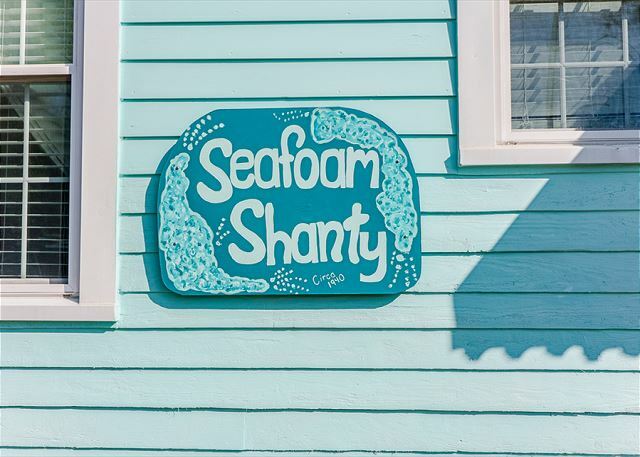 Welcome to our cottage, Seafoam Shanty! 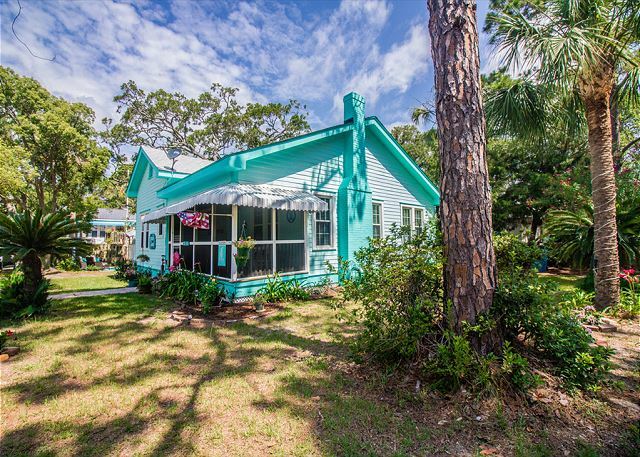 Built in 1940, this little cottage is a true classic Tybee beach cottage. Seafoam Shanty, circa 1940. Welcome to another era! Adorable, fun Seafoam Shanty is all yours for your vacation! Dog-friendly ~ the owners rescue greyhounds! Wonderful screened porch ~ you can sit here and watch the world walk by on 10th St. or 2nd Ave and say "Hey!". Screened porch. If you stand at the edge of the yard you can actually see the 10th St. crossover to the beach! So. Close! Living room with his and her recliners, a wonderful flatscreen TV and those amazing hardwood floors! The living room from your recliners. Comfy living room is a great family gathering place. Screened porch is to the right of the couch. Dining room is right behind the living room for a large, open floor plan. You can see queen bedroom #1 to your left. Bathroom is thru the door on the right. Wonderfully updated kitchen is right off the dining room for easy service and clean up. You won't miss much cooking in here! Queen bedroom #1 is at the front of the house. Cozy bed and soft serene colors for a great sleep. Twin bedroom #3. Great for siblings, cousins, friends or a small group. Twin bedroom #3 is off the kitchen. Bathroom #1 between the two queen rooms. Queen bedroom #2 is on the other side of the shared bathroom with Queen #1. Flatscreen TV for late night viewing. Love those colorful fish and turtles in this queen bedroom! A true underwater delight. Outdoor (carpeted!) seating. Bring a sheet and a projector and you can have an outdoor family movie right here. Outdoor seating under the carport for covered dining. Come see us at Seafoam Shanty! Screened porches are necessary on the beach. And ceilings should be painted 'haint blue' to give guests good luck! Wonderfully unique shelving made of wooden crates. Living room. We love this bathing diva. Comfy living room with recliners and unique shelving made of wooden crates. Outdoor dining off the kitchen. All the cute little details make Seafoam Shanty vacation perfect! Seashells, pinecones and dolphins ~ #TybeePerfect! Adorable dining table with starfish painted on the back. Hand painted starfish on the dining room chairs are just another fun beachy touch! Queen bedroom #1 off the living room and dining room. Queen bedroom #1 ~ so serene! Shared bathroom #1 between Queen bedrooms #1 and #2. Full bathroom with lots of lush towels! Wonderfully modern and updated kitchen. Modern kitchen in this adorable vintage home. Stainless steel kitchens are wonderful. Twin bedroom #3 is off the kitchen for easy midnight snacking. Bedroom #3 has 2 twins. Bathroom #2. Lots of lush towels here, too! Queen bedroom #2 turtle details. Queen bedroom #2. Shared bathroom is on the other side of the fish wall. Queen bedroom #2 has a great flatscreen TV! Stacked washer and dryer for laundry convenience! Door off the laundry room to the backyard covered outdoor patio. Grilling made perfect. Just get the local seafood and you're good to go! Our kitchens are well-stocked! Back and side yard of Seafoam Shanty. Side yard of Seafoam Shanty with outdoor living room. Deck to our outdoor eating area. Front of Seafoam Shanty on 10th St.
How lush and tropical is this cute little home? You're at the beach, now! Outdoor and covered dining area off the back deck. Amazing landscaping tell you you're in the sub-tropics! Side yard of Seafoam Shanty. Bright, cheery Seafoam Shanty tells you you're on vacation... starting... right... NOW! 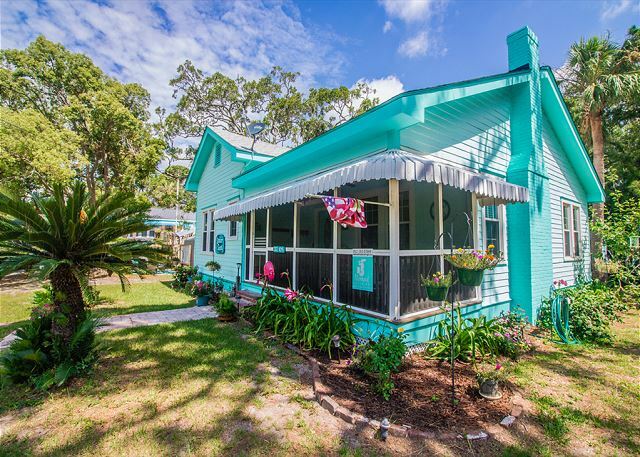 A quintessential Tybee beach cottage! It has adorable, colorful and fun written all over it! Drive up to this cottage and you can't help but smile! It is all dressed up in a super fun seafoam hue perfect for setting the tone for your fantastic beach vacay! A pink flamingo stands guard outside the perfect screened porch! Screened porches are just about a MUST at a beach cottage! Perfect place to sit and enjoy cocktails, a cup of Mermaid Morning Bliss coffee or just Tybee people-watching! Bright living area with super comfy seating, gorgeous hardwood floors, flat screen TV and books and games galore! A dining room complete with starfish dining chairs; yep, you're at the beach for sure! 2 super relaxing and cozy bedrooms with queen beds (one with flat screen TV) and a 3rd bedroom with 2 twin beds. A perfectly cute, fully equipped kitchen outfitted with stainless steel appliances. Perfect for whether you're cooking up your Tybee seafood feast or preparing a beach picnic! This great cottage continues to wow you with a great outdoor dining and seating area in the back! Seafoam Shanty is located just a few short blocks to the beach! You can walk to the beach and have no parking fees! Seafoam Shanty is an amazing Cottage. Bedrooms are spacious and kitchen is well appointed. The screened in porch on the front of the home is also nice. The grounds would benefit from a clean up as there is a lot of clutter. The outdoor furniture could also be updated, but certainly is functional. My family and I enjoyed the space and amenities of the quaint beach house. The TVs were awesome and the kitchen had everything! We loved the decor which reminds you that you are enjoying beach life everywhere you look. We had plenty of space to spread out. I highly recommend this place for families. Rented this house for a "Girls Getaway." We are four women in our fifties. This house was perfect for us! It had plenty of space. Each bedroom is on a different corner of the house, so there's plenty of privacy. The porch is small, but was big enough for all of us to sit and visit. The house is decorated very beachy and cute. We didn't use the outside seating areas, but there are several. We did use the outdoor shower, which is not private, but was great for rinsing our sandy feet. Best of all, the beach is only two blocks away! It was a very quick walk from the house! And there is a ramp over the dunes, making it wheelchair friendly. We were sad to leave this house! The Mermaid Cottage ladies contacted us just before the trip and just after we arrived to make sure everything was OK. They sent lots of information by e-mail well ahead of the trip, so we felt prepared for how to get there, how to enter the house, etc. We've rented another house from Mermaid Cottages and were very please with that rental, also. You can't go wrong with them! Another great stay with Mermaid Cottages! This is the third different Mermiad Cottage we have stayed in and they are all wonderful! Seafoam Shanty was perfect for our family with small kids—on the bike path, a short walk to the beach, homey and comfortable. As always, the Mermaids took care of everything and our week long stay was perfect. We cant wait to return to Tybee and Mermaid Cottages again next year! This house was all we expected from our research about this area. The property was well maintained and clean. The access to the beach was great. With two kids, everyone had their own space and had a blast. This will be my third stay at mermaid Cottage and my first stay in this perticular house. The house is nice, cozy, and vintage, but will all of the modern upgrades. With a kitchen stocked full of pots,pans,and utensils, I save money on eating out. They even have games and toys with my 3 yo. I will stay at one of their locations on every trip to Tybee! Had a marvelous time! This little cottage was really cute. We were only there a short time. But, easy walk to the beach (one block away). Very enjoyable experience. Sea Foam Shanty provides the perfect location with plenty of room. Nicely decorated & very comfortable furnishings. Inside & outside living spaces, including great screened porch. Up to date with technology: wifi & flat screens in living room & bedrooms. Parking for multiple vehicles. This is my first rental; I highly recommend & will rent again! The SeaFoam Shanty was perfect for my family's Labor Day weekend get away. We love Tybee Island and always rent hotel rooms but decided to try a vacation home rental this time. It was perfect. The house is adorable with plenty of space. It's not to far to walk to the ocean. We were able to really enjoy the screened in front porch and watch everyone walk by walking their dogs or riding their bikes. There was plenty of linen (towels, wash cloths) available and there were even beach chairs we were able to bring down to the beach with us. We loved this fun little cottage for our stay on Tybee. We will definitely be back! Everything, including location, was great. The only two minor items that may need attention were the refrigerator not dispensing ice or water and the dishwasher not always releasing detergent; but these are minor. Having been a Mermaid guest multiple times, i realized the great advantage Mermaid has over competitors, such as Air B'n'B: Mermaid anticipates their guests needs better than anyone. Knowing this frees the guest from worry, and isn't that the point of the trip? Rented for a few days while in the area for son's graduation. Location was perfect to the park where we hosted the after party. Short distance to the beach, however, we went down to another friends location to enjoy that so I can't give exact details. House is laid out well with plenty of room inside and out. Property was clean and neat so no complaints from our group. Seafoam Shanty is one of our newest cottages to the Mermaid collection so we are happy to hear you enjoyed your stay! Please let us know when you need some more Tybee time with your Mermaids. Wonderful accommodation. So many positives about this place it's hard to know where to start. So I'll start at the beginning... after many hours of travel, I needed to shower off. The shower was amazing! Then a short walk down the street to the beech where my grandchildren were able to play and see the ocean for the first time. Amazing beach. back at the beach house, grandbabies and I played on the porch while mama made dinner. Then popcorn and a movie on the television set. The mermaid company was very attentive when I contacted them to ask the location of a lightbulb. Very friendly bunch, but not intrusive. Very nice neighbors. Nice neighborhood. Ideal really. I plan to return soon. So glad you enjoyed your time at Seafoam Shanty! Sounds like you discovered the true difference between a wonderful little beach cottage and a little room in a wonderful hotel. We do love the GOOD Neighbor policies the vacation rentals and year round residents work together on on Tybee. Come see us again soon! The Mermaids.